Specialized takes its mission to help you with your fitness goals seriously with the Sirrus Sport looks slick and handles well. We’re going to compare this model with other similar ones in the manufacturer’s line. Then, we’ll see how it stacks up to the competition with a rundown of its features versus that of other brands. What is the Specialized Sirrus Designed to Do? The Specialized Sirrus Sport is an excellent choice for the individual who is serious about improving their fitness. At a higher price point, it has plenty to offer with better components and a geometry focused on a comfortable ride. It’s the kind of bike that can match your evolving workout goals with its versatility. As you get stronger, the Sirrus Sport will keep pace with your added demands. That gives it an evergreen quality that makes it definitely worth a look. Who is the Specialized Sirrus Good For? The Sirrus offers a sporty, nimble ride for the individual who will appreciate the ability to turn on the heat to ramp up their exercise intensity. The bike has quality components to ensure a safe and stable ride that can handle virtually any conditions or punishment. Comfort is the underlying theme with a welcome balance with performance. The Sirrus Sport has a Specialized A1 Premium Aluminum frame with a FACT carbon fiber fork which helps dampen vibrations of the road for better power transfer. It features its proprietary Fitness Geometry to keep the emphasis on comfort. It also uses fully-manipulated butted tubing and integrated lower bearing. The Sirrus Sport has an FSA Vero, forged alloy, sub-compact crankset and a Shimano, 9-speed, 11-34t cassette. It also uses Shimano M315 hydraulic disc brakes and microSHIFT flatbar road, 9-speed shifters for superior stopping power than other models using other types. The tradeoff comes in added maintenance and cost. The combination of the aluminum frame and the carbon fork provide the best of both worlds to bring the Sirrus Sport in at an affordable price. The Sirrus Sport delivers a comfortable ride with excellent vibration dampening qualities because of its frame and fork design. The frame comes with eyelets for mudguards and pannier racks to customize your steed. Some individuals may find the position too upright for their tastes with its very relaxed geometry. You may need to swap out the Nimbus Reflect tires if you typically take to rougher terrain. How Does Specialized Sirrus Compare to Other Bikes from Specialized? If there’s one thing we can say about Specialized, it’s that they understand their discerning users to offer such a broad range of so-called fitness bikes. While similar in price, they vary widely in their geometries and thus, how they will handle on the road or trail. You should have no problems finding a comparable model to suit your riding style. Here, we'll compare the Sirrus to Specialized's Crossroads Sport, Roll Sport EQ, Trail Sport, Ariel Sport, and Sirrus Elite models. The CrossTrail Sport stands out with the longest stack, and thus, the more aerodynamic profile of the rider and greater speeds. The Sirrus Elite comes at the other end of the spectrum with a taller stance. But the Sirrus Sport beats them all at 563mm for a more upright and more comfortable position which can be a dealmaker or deal breaker for some users. At 401mm, the Crossroads Sport offers greater stability with the Roll Sport EQ opting for better slow speed handling. The Sirrus Sport comes in the middle of the pack at 388mm. Again, we see a lot of variations in the wheelbase, presumably because Specialized knows that people define fitness differently. The Crossroads Sport can provide a more comfortable ride with its longer distance to make workouts enjoyable. The Sirrus Sport measures 1056mm which is what we’d expect in a touring bike meant for longer rides and touring. 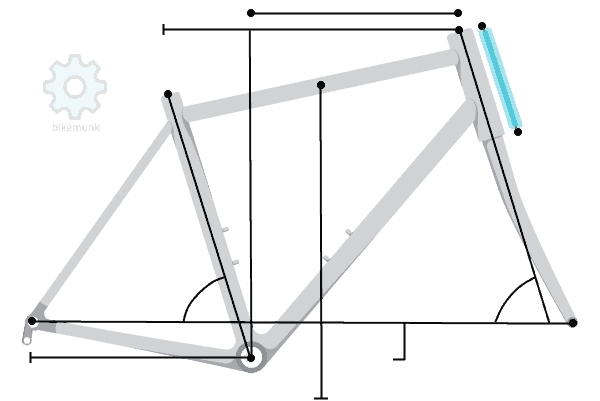 The head tube length will also play a role in the profile of the rider. As you can see, the Crossroads Sport leads the crowd with upright comfort. The Ariel Sport is appropriately named with its lower stance for better aerodynamics. At 13.0cm, the Sirrus Sport strikes a fine Goldilocks balance between comfort and performance. As you can see, the price ranges for some of Specialized’s fitness models are comparable which can make choosing one difficult at first glance. That’s where knowing the bike’s geometry can steer you in the right direction. The components will also help because the differences will fine tune your ride. All of the bikes use sub-compact, double cranksets, but that’s where you can see the subtle variations for matching the model with your style. All use Shimano components that give them the quality edge except the Ariel Sport and CrossTrail Sport which have Sunrace, 9-Speed, 11-36t gear systems. The Roll Sport EQ uses the MicroSHIFT, 9-Speed, 11-34t model. The Roll Sport EQ and Crossroads Sport have V-brakes which is to be expected in lower-end bikes. The others all have hydraulic disc brakes that give them a clear advantage in terms of better braking power in any conditions. On the downside, these brakes are heavier and more of a pain to set up properly which may deter new users to the sport. How Does Specialized Sirrus Compare to Similar Bikes on the Market? If the Specialized Sirrus Sport doesn’t work out for you, there are plenty of other options with similar features from different manufacturers. Let’s run through some of the numbers to see how they compare based on their respective geometries and components. In this section, we'll compare the Sirrus to the Giant Escape 1, Trek FX 3, Diamondback Haanjo, Cannondale Quick 4, and the Diamondback Insight 2. Giant’s emphasis on escape comes through with its measurements that promise a more aerodynamic and stable ride for the long haul. The Sirrus Sport aims for a middle-of-the-road approach with a longer 563mm stack for upright comfort and a shorter reach for better maneuverability. The profile is definitely a matter of individual taste as some may not like the loss of speed. Wheelbase = the level distance between the front and rear wheels. All of our alternatives have a similar wheelbase that falls within the touring bike range including the Sports Sirrus at 1056mm. The Haanjo approaches that of a cyclocross bike suitable as an all-purpose bike. The Giant Escape 1 Disc leans toward a more comfortable position, though it may border on a somewhat too relaxed ride for some. All of the bikes fall into the touring range with their longer wheelbase lengths including the Escape 2 at 1079.5mm. That makes sense in a bike marketed for longer jaunts. The Ariel Mechanical Disc again stands out with its preference for a more nimble ride indicative of its branding. The chainstay length gives you yet another way to tweak your ride with a longer distance for better climbing traction and a shorter one for greater power transfer. All of the bikes including the Sirrus Sport at 445mm have what we’d expect for touring models. We can assume that fitness means longer rides, and thus, the premium that manufacturers put on this aspect of the geometry. One of the major differences with these bikes lies with the types of brakes they have. The Insight 2 and Haanjo both have mechanical disc brakes, whereas the Quick 4 has V-brakes. The others have hydraulic disc brakes which are superior for technical riding and precision control, albeit, at a higher cost with more maintenance than mechanical disc brakes. The Sirrus Sport has the advantage here with its Shimano M315 hydraulic disc brakes. We prefer their greater sensitivity and crisper feel they have on the road. While easier to set up, you’ll need to apply more force with the mechanical disc brakes with less precise control over them. I have a Sirrus that I added fenders to for commuting, and I’m happy with it. Now that SRAM has released their NX Eagle 12-speed drivetrain, I can convert to 1×12 with a 42 tooth front chainring for touring with a trailer. And before the trolls fire up their keyboards, I’m also aware that most touring bikes have drop bars, but my asthma doesn’t let me ride with drop bars because it compresses my diaphragm.